My children have played with their Guidecraft Roadway System (SRP $88) every day since they received it and I love that it promotes their creativity through open ended play. 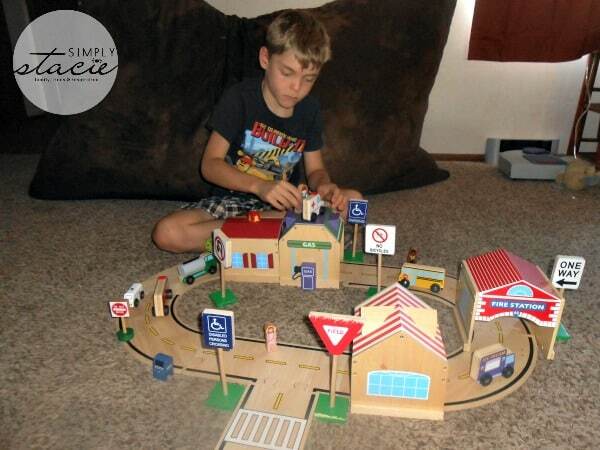 This creative wood toy set allows children to design their own roadway system and build cities complete with easy to assemble roadway configurations. These larger sized pieces are very appealing to children and the kids love to play with their designs. I appreciate that I can continue adding to the set with Community Buildings (SRP set of 6/$88) and the Community Roadways Essentials set (SRP $44.95) to continue keeping play fresh and fun! The Community Roadways Essentials is an excellent addition to our Roadway System. It is a complete block play accessory collection and my three children were so excited to starting creating their new city. 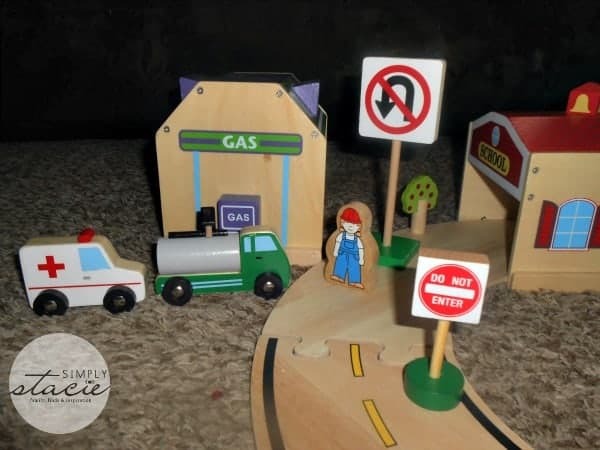 It includes a 36 piece wooden block play set that features 6 vehicles, 12 signs, 6 community workers, and two separate 4 piece family sets. 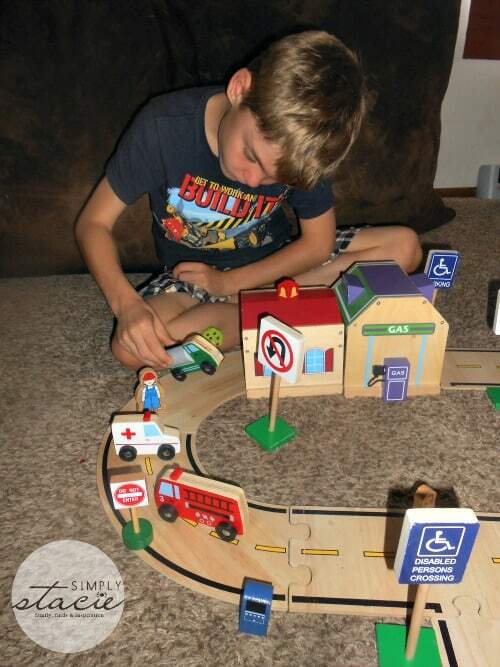 They love figuring out what each road sign means as they pretend to drive the fire engine, school bus, police car, ambulance, city truck and their favorite, the ice cream truck. Adding the wooden community workers and additional people really elevated their play time as they could now incorporate role playing and practice team work and social skills. Guidecraft is known for its exceptionally constructed wood toys and this product is no exception. The pieces are extremely durable and made of solid wood construction so it can withstand years of interactive play. Recommended for ages 3 and up, this play set is sure to get lots of use with young children. I am very pleased with this set and it is an even bigger hit with my children who are ages 5, 6 and 8……it is a toy they can enjoy playing with independently or cooperatively. As a proud member of the Guidecraft Educator Bloggers team, I am passionate about this exceptional brand of the highest quality toys in terms of educational and entertainment value. You are invited to visit Guidecraft to purchase the Roadway System, the Community Buildings and/or the Community & Roadway Essentials or browse the complete line of wood toys and furniture. Any of these items would make excellent gift ideas for a special occasion or for the holidays. I am sure you would love a chance to win the Guidecraft Community Roadway Essentials set, right? Hurry over to visit fellow Guidecraft Educator Blogger team member, Mommy Moment to enter to win this wonderful play set! Connect with Guidecraft on Facebook and Twitter. this looks like something my 2 year old would love! he loves trains and cars. That is so cute! I love it. Looks like a lot of fun, nice that it’s a track, but not confining like a train track. I would love to have this for my daughter/daycare. That looks like an awesome toy! I love wood toys. Oh my these look so fun I would have loved this one as a kid and I know someone who would love to have this thanks for sharing this post and have a great day. If he really likes road signs…Guidecraft has a neat set of road/traffic signs that are “life size” (very lightweight) and can be taken outside for “use” while bicycling and all sorts of other creative ideas. My kids LOVE playing with their set. You can take a look at their website. my nephew would love that. This is such a low price for something that will entertain and encourage creativity in the kids.A great present for Grandparents to give. Building roadways driving cars, this looks like a fun, great toy, that would keep their attention for a long time. Thank you for sharing. I love how you can keep adding on new sets and accesories. Keep kids entertained and intrigued. Plus, with the added sets and people more than one child could play together and have fun. Great set for creativity! The wooden pieces will hold up well, too. Love this toy! Would definitely encourage creativity. I am sure my little nephew would enjoy it! The kids will enjoy this! Fun and educational, too. This looks so nice and sturdy, and a great way to encourage creative play.